Between ice cream and soft serve, I love the latter much more. Whenever I see mr bean, I’ll get a craving for their soft serve. EVERY SINGLE TIME. The worst thing is they have counters at all the mrt stations I frequent so it means I have to go through that mental battle very often haha. My ideal soft serve would be a balance between creamy and light, not too sweet, and it’s a major plus if it has some fresh flavour that doesn’t taste artificial. While I love tsujiri’s green tea soft serve, it does tend towards the creamy side which is not a bad thing but as I said, I prefer my soft serve to be light. 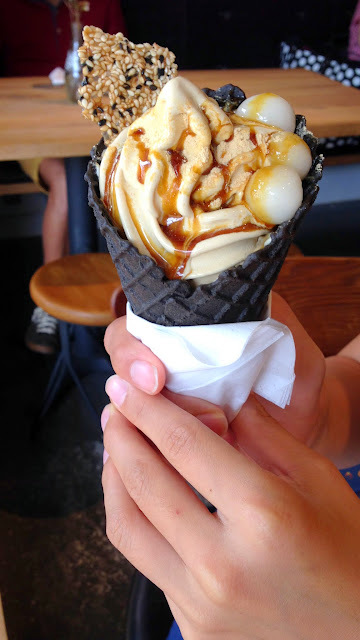 Sunday Folk’s soft serve tends towards the light category but it is also sweeter. Some of the friends didn’t like it because of that but I was pretty okay with it. It wasn’t that saccharine sweet because the flavours did come through. Kudos to the team for putting in effort to replicate the creamier flavours but yet anchoring it on a different concept. Same same but different. The waffles were super delicious by the way. The exterior was beautifully browned till crisp, and the insides were light, and not too dense. I think they would be good alone without any ice cream actually. 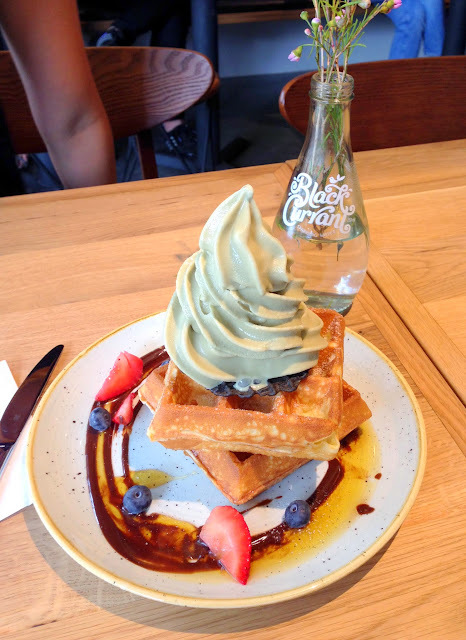 The soft serve was separated from the waffles by a waffle disk. Clever. Between the gula melaka and pistachio soft serve, I prefer the pistachio. You still get the essence of roasted pistachios, but it’s really a lighter version of creamier’s famous roasted pistachio. I thought the sea salt gula melaka suffered from a lack of balance in terms of sweet and salty. To me it tasted too salty and too sweet. Funny, I know, but it’s true! The ice cream itself was salty, but the gula melaka syrup was way too sweet. Still an interesting combination though. Maybe the flavours would be more balanced if I had the soft serve sans syrup. The space in Sunday folk is quite lovely but my goodness, the crowds. They have reduced their opening hours too so I think they are having difficulties handling the demand!